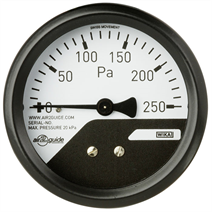 The model A2G-mini differential pressure measuring instrument is used for monitoring differential pressures of the filter units in small and medium-sized central air-handling units. Further application cases are in industrial air extraction units and dust extraction plants as well as in the cleanroom industry. Its compact design and flush panel mounting enable an optimal integration in the enclosure structures of ventilation equipment. The pure metal design – with the case from stainless steel and the measuring system and movement from copper alloy – ensures maximum hygiene. Due to its silicone-free materials the instrument can also be used in the painting industry and its applications. The high IP68 ingress protection and the UV-stabilised window also enable operation in outdoor areas.